Over 120 nations from the Middle East, Africa, Asia, and Latin America have already endorsed this initiative, but Israel's right-wing government and the US vehemently oppose it. The UK and other key European countries are still undecided, but a massive public push now could tip them to vote for this momentous opportunity to end 40 years of military occupation. While the roots of the Israeli-Palestinian conflict are complex, most people on all sides agree that the best path to peace now is the creation of two states. But repeated peace processes have been undermined by violence on both sides, extensive Israeli settlement-building in the West Bank, and the humanitarian blockade on Gaza. The Israeli occupation has shrunk and fragmented the territory for a Palestinian state and made daily life a crippling ordeal for the Palestinian people. The UN, World Bank and IMF have all recently announced that Palestinians are ready to run an independent state, but say the main constraint to success is the Israeli occupation. Even the US President has called for an end to settlement expansion and a return to the 1967 borders with mutually agreed land-swaps, but Israeli Prime Minister Netanyahu has furiously refused to cooperate. It’s time for a dramatic shift away from a futile peace process and on to a new path for progress. While the Israeli and US governments are calling the Palestinian initiative ‘unilateral’ and dangerous, in fact the world’s nations overwhelmingly support this diplomatic move away from violence. Global recognition of Palestine could crush extremists, and foster a growing non-violent Palestinian-Israeli movement in step with the democratic momentum across the region. Most importantly, it will rescue a path to a negotiated settlement, allow the Palestinians access to a variety of international institutions that can help advance Palestinian freedom, and send a clear signal to Israel’s pro-settler government that the world will no longer accept their impunity and intransigence. 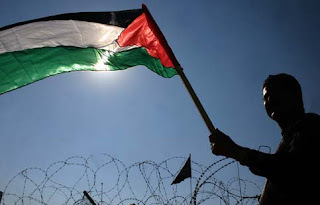 Palestinian statehood will not bring a resolution to this intractable conflict overnight, but UN recognition will change the dynamics and will begin to unlock the door towards freedom and peace. Across Palestine, people are preparing, with hope and expectation, to reclaim a freedom their generation has never known. Let's stand with them and push European leaders to do the same, as they have stood with the people of Egypt, Syria and Libya.